Judy Garland Online Discography: Judy. London. 1969. 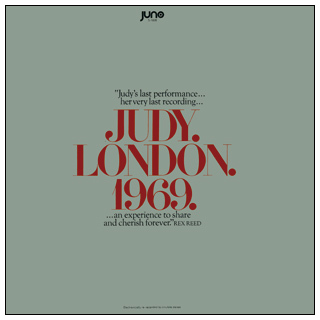 Released in late 1969, this LP is made up of performances from Judy's last few weeks of appearances at the "Talk Of The Town" cabaret in London. She performed there, off and on, from December 30, 1968, through February 1, 1969. The exact dates of many of the recordings are not known, as they were culled from tapes made by both Judy's husband at the time, Mickey Deans, and her friend and companion John Meyer. The version of "I'd Like To Hate Myself In The Morning" on this LP is actually from Judy's appearance on the Merv Griffin show on December 19, 1968, in New York City. These were not really Judy's final performances. She still had several performances ahead of her including the Scandinavian tour. Nor was it her very last recording. Judy's then husband Mickey Deans recorded Judy, himself, Anita O'Day and Charlie Cochran rehearsing for their appearance at the Half Note Club in NY on June 16, 1969. These are the last Garland recordings known to exist. You can listen to these recordings at The Judy Room's "Judy Sings! Miscellaneous" page. Rex Reed was nominated for a Grammy for his liner notes to this album. Image of the original release (top image) provided by Richard Allen - thank you! All other images from the collection of Scott Brogan. 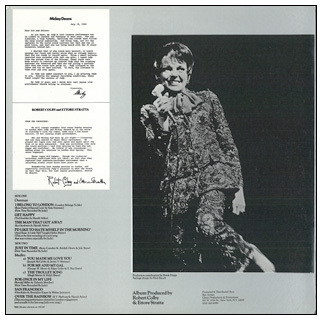 Photo above right: The back of the album, featuring a photo of Judy on stage at The Palace Theatre in 1967. 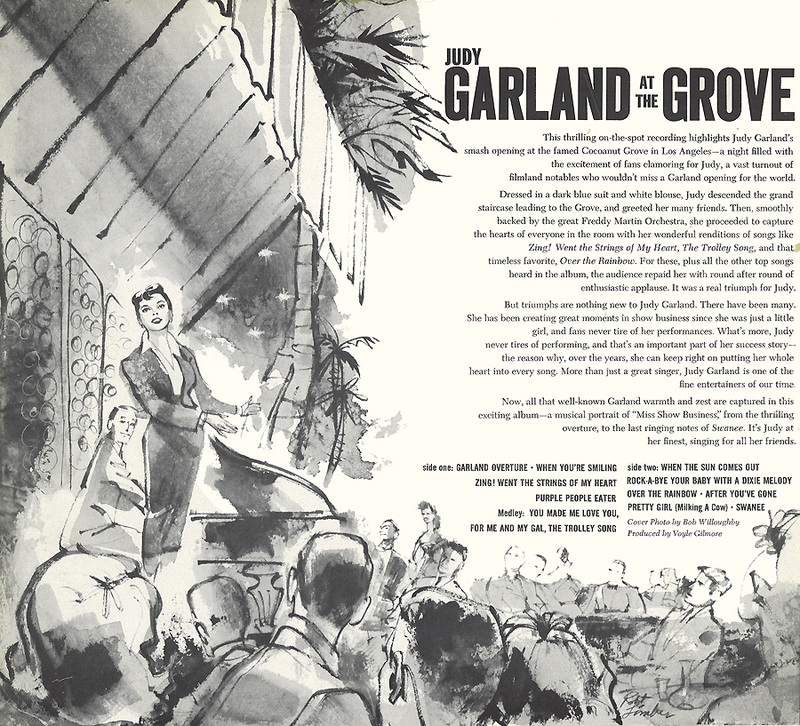 This gatefold album opens up to reveal the Rex Reed liner notes with another photo of Judy, in a similar pantsuit (she has several versions), during her run at "The Talk Of The Town". 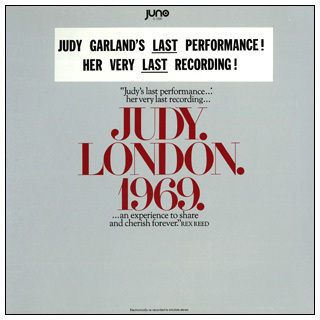 The re-release, with the sticker slapped on the top to tout that this was Judy's "Last Performance!" As you know, my Judy's last cabaret performance was in London in January and February of this year. She was fabulous, a tiny tornado, thrilling the crowds that filled the many tiered auditorium. And being Judy, not all the applause in the world could convince her that she was in good voice, and that she was being heard within the 30 piece orchestra behind her. I decided that if she could hear herself, it would assuage her fears and surely prove what we already knew --- that she was ready to record again. Using a small battery-operated tape recorder with just one mike, I taped Judy from the second tier of the balcony. These tapes were made solely to convince my fearful Judy that the crashing applause was deserved and that she was giving a performance that she could take pride in. Judy listened to the tapes and was at once excited. In fact, she listened to them over and over again. As Judy was under contract to you, I am offering them to you. Despite the unusual recording conditions, these tapes caught the essence of Judy. My judy is gone, and I think this last joyous club performance should belong to everyone. We will always remember that sunny Sunday morning in London when Judy and Mickey showed up at our suite at Claridge's with the tapes, made only a few hours earlier, of her closing night performance. She and Mickey had been up all night ---- listening. And now they wanted to share their excitement. We played the tapes over and over again and again until the four of us were exhausted. Judy was performing like only she could perform ---- and that morning we knew she was happy and confidant. We talked of new recordings ---- making plans for sessions in London that Spring. They never happened. These tapes did happen. Though the technical recording conditions were not ideal, we feel that they captured that audience-performer excitement that a recording studio could never have given us. Remembering that sunday morning in London, and especially recalling Judy's pleasure in what she heard, we feel that this, her last joyous performance, should be shared. She was superbly hip, intelligent, sensitive, funny; and she could sing like an angel. From the very beginning, when she stepped out of that show business trunk and squeezed her chubby little feet into those ruby red slippers for that tippy-tap kip down the yellow brick road, people everywhere began a love affair with a girl named Judy Garland that was destined to go on forever. We loved her innocence and her vulnerability as soon as we were old enough to see our first movie. We loved her when she was happy and we loved her when she was blue, and most of the time she was both. When she soft-shoed across the empty stage with a cleaning woman's broom in Presenting Lily Mars, we cried. When she pushed Andy Hardy into a pot of geraniums, we laughed. We loved her on the trolley singing to the boy next door and trying to save Margaret O'Brien's snow people in Meet Me in St. Louis (in fact, we loved her so much that when she sang the title song, we would have met her in St. Louis or anywhere else if she had only told us what time to be there). After The Clock, women met their soldiers under the clocks in railroad stations all over the world, and after The Harvey Girls, the stock went sky high on the Atchison, Topeka and the Santa Fe. We loved her with lettuce in her jeans and we loved her when she didn't have a bean. And by the time she got around to letting it all hang out by singing Born in a Trunk in A Star is Born, we wanted to say, "yes, judy, we know." Nobody who ever saw her or listened to her records ever needed a last name. It was always Judy. She grew up, and her troubles were our own. We read about the pills and the hospitals and the lonely tortured cries for help and - this is the truly remarkable thing about Judy Garland - we never stopped caring. We cared because she was no ordinary, run-of-the-kleig-light Hollywood legend. She was our little girl. She asked for more sympathy than we could afford to give her and sometimes she got on our nerves, but then she'd step out on the stage at Carnegie Hall or the Palladium or any old stage at all, it didn't matter, and the spotlight would hit those fail little legs and capture that wry, helpless little wince of a smile and somehow we'd forgive her for keeping us waiting. Sometimes the voice was tired and rough round the edges. It would bend and crack and she'd sip something cool (we were never quite sure what it was) and then it would soar again, like a turbo-jet readying for the transatlantic takeoff, and a bolt of sunlight would stop our hearts in the middle of a sigh. There will always be imitators, but there will never be anyone like Judy. She tried our patience and she used our love, but she paid us back a hundred times over. The endurance of her art is inestimable, but it is warming to know that through recordings like this one, it will always be there for new generations to discover. There is something special about this particular collection of her work: it was recorded in january and February, 1969, during her last public appearance. She was playing a five-week engagement at London's leading cabaret when musician-songwriter-producer Bob Colby talked her into returning to the old recording mike. Judy was nervous. Her voices was in one of it's up-and-down phases. There had been some disastrous TV appearances in New York; during one Merv Griffin Show on which I also appeared, it even gave out completely. She was interested, but frightened (two characteristics which had always marked her life) and to encourage her, Colby suggested taping several of her appearances in the club to re-acquaint her with the sound of her voice and re-convince her over her own magical charisma on records. Judy was cooperative. Every day she would arrive at Colby's suite at Claridge's to listen to her voice, like an enthusiastic young hopeful. Her confidence returned and she was impressed enough to agree to do a brand new album. It never happened. Four months later, Judy Garland made her final headline and the world was a sadder place to be. It's all here in this historic tribute - the joys and the grins of those last days in London - sealed for posterity. Something old, something new. There's an old music hall revue tune, I Belong To London, for which Stan Freeman contributed special lyrics to express some of the happiness Judy felt in her new life there. There's a zappy little cheery-bird song called I'd Like to Hate Myself in the Morning (and Raise a Little Hell Tonight), written by john Meyer, a young New Yorker who was close enough to her in the last months to pen what could easily have been her own survival slogan. There are the great Garland memory pieces, Get Happy and The Man That Got Away and For Me And My Gal and The Trolley Song, and, of course, her love letter to Clark Gable, You Made Me Love You. And as a historical subtext to the legend, there is Judy singing for the very last time the most touching rendition of Over the Rainbow I've ever heard. And through it all, there is that indomitable spirit, kidding herself, kidding Hollywood, full of the eagerness of another comeback. She would have come back, and we would all have been there waiting for her. That, I think, is the reason her place in history is secure and unchallenged. Even when we thought we couldn't bear to read another unasked-for news report, even when she taxed our tolerance and wore out her welcome, we never stopped caring! She needed more love than anyone had the strength to give. But she always paid her dues by making her audiences smile and cry and - I hate to say it - get involved. She was like that favorite old star at the op of the Christmas tree. Other ornaments would break through the years or get chewed on by some dog or child. We'd replace them with newer, fancier models. But back in the back of the box, wrapped in soft tissue, would be the star, durable and comfortable to be with because it had lived through so much and survived it all. Judy was like that star. her light has gone out for now, but nothing will ever erase the memory of her glow. Through her movies and her songs, it will be Christmas for as long as we care to remember.